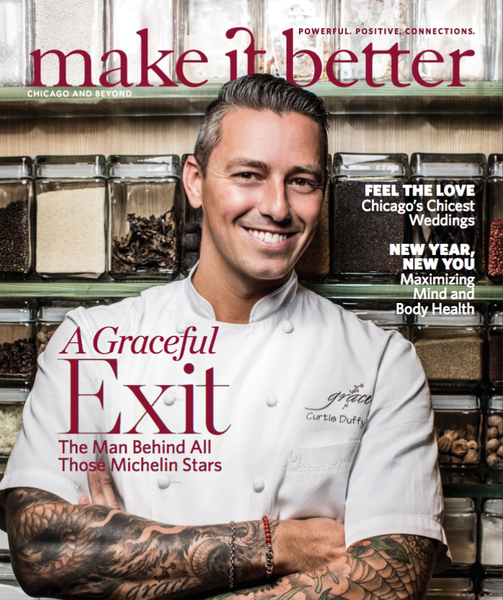 Chicago-based magazine Make It Better introduced a redesign in its January/February 2018 issue. “It feels more like a traditional magazine,” founder Susan B. Noyes told Publishers Daily. The redesign was inspired by the look and feel of San Francisco Bay-based Marin magazine and Spaces, acquired by Make It Better Media in November. Make It Better’s readers tend to be affluent, well-educated homeowners and mothers, with an income above $250,000, Noyes said. The new Make It Better is larger, too, with a 9-inch by 10.75-inch format. “You’ll quickly see that its pages are packed with more original photography and in-depth editorial about the people, places and causes that make Chicago great,” stated editor-in-chief Brooke McDonald. Make It Better’s site will also get a redesign, likely up by month's end. A San Francisco edition of Make It Better’s newsletter, called “Better Letter,” will launch March 15. The brand started as an online publication in 2007, then launched a print magazine in 2009. Make It Betteraims to connect its audience with organizations, businesses and nonprofits that have positive social impact in the Chicago community. The acquisition of Marin and Spaces last fall opens up the doors to content collaboration opportunities in the future with Make It Better, given the similarity in lifestyle for its target readers. Make It Better publishes six times a year, with each issue focused on a theme, such as its May/June food and dining issue, and its November/December holiday issue. The magazine has 38,000 subscribers in Chicago. (The publication is not available on newsstands.) Marin and Spaces have similar circulation numbers, Noyes said. The recent acquisitions also expand advertising opportunities for Make It Better, she noted, such as California wine country ads for the Chicago publication.